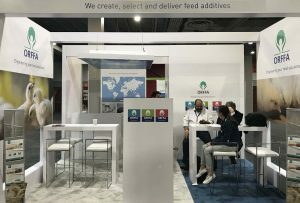 Orffa International was proudly present with a booth at the first edition of the LPN Congress held in Miami from October 23 – 25 where we welcomed our customers and visitors during the event to discuss about our Excential product range and the vitamin market. This was a successful congress that allowed Orffa to increase its technical and commercial footprint in the region. Orffa´s participation was enhanced during the event by a number of distinguished guests from the poultry industry that travelled with us from various countries in Latin America such as Mexico, Guatemala, Costa Rica, Brazil and Colombia. Our Central Technical Manager from Belgium, Tom Rijsselarere participated in the scientific program during the LPN Congress with a technical presentation to discuss the benefits and use of our SMART organic trace mineral range and organic selenium Selenium 4000 in poultry nutrition. The Sales and Technical Team took the opportunity to hold a regional sales meeting for the Americas after the event to follow up on the latest commercial and technical developments in the region.